I still remember when Fifth Dawn came out and brought Crucible of Worlds with it for the first time. Has it really been fourteen years? I must confess that back then, I really didn’t know what to do with it. I was aware that there were red decks in tournaments that tried to destroy a lot of opposition lands, but it’s a little slow for counterplay against that sort of thing. 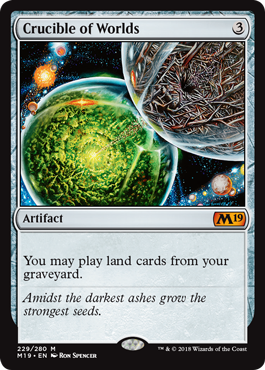 It soon became apparent that it interacted with Wasteland and Strip Mine in formats with cards from the 1990s, and even though that’s barely faster, it gives you an impressive sort of inevitability. Nowadays, we have a whole bunch of newer lands that can sacrifice themselves for an effect: even recurring something like Memorial to War from Dominaria will pay off in the long run. This card is an excellent one to build around and a lot more effective than it might read at first. Crucible of Worlds, one of the products of the “You Make The Card” campaign (all the way back in Fifth Dawn), is one of those cards that seems innocuous but really isn’t. If you see a Crucible of Worlds, the odds are good that the deck isn’t going to play fair. If you have effects that rely on sacrificing lands, milling, or otherwise sending them to the graveyard, Crucible can be a way to make sure you don’t run out of mana for your schemes. It’s a good “failsafe”, especially if you have creatures like The Gitrog Monster bouncing along and nomming everything in its path. Of course, Crucible also does not play fair, and being able to generate a lock with Dust Bowl, Wasteland, or Strip Mine is simultaneously satisfying and the fastest way to lose friends. But who cares?